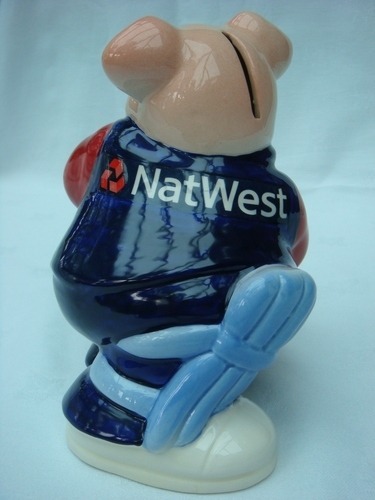 In 2007 NatWest commissioned a limited edition "Cricket Pig", a.k.a. "Wicket", to promote the annual NatWest Cricket Series. With a limited edition of only 500 these pigs are very rare and very collectable. Pigs were given to customers and members of staff throughout 2007 and 2008 and were often accompanied by a letter of authenticity. However, it is also known that a large number of 'prototype' versions of these pigs were released by the manufacturer, Paul Cardew, in 2008. Check for the correct colouring i.e. 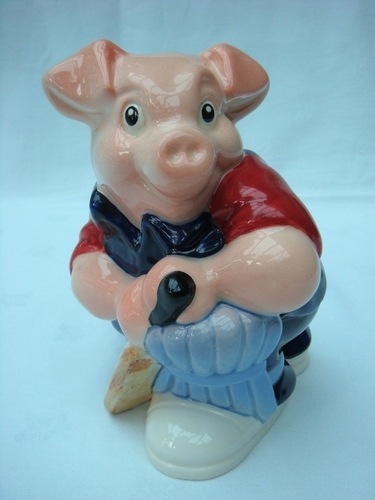 blue trousers and blue shirt with red sleeves and inscription "Designed and manufactured for NatWest by Cardew" on the base of genuine pigs.